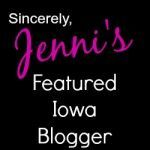 Jenni, a fellow Iowa blogger has a weekly feature on her blog, Sincerely, Jenni, to highlight some other local bloggers. My guest post went live this morning! I hope you'll check it out! And stay awhile to read more about Jenni. She is a seriously so funny and covers a broad spectrum of subjects. Also, while I'm here- Congrats to Erika for winning the Detour SMART bar giveaway! Thanks to all that entered.